Everyone could use some Southern Hospitality every now and then, and Chez Shells offers just that, and more. This newly renovated split-plan home has a highy desirable West Gulf Drive location, and the Gulf of Mexico beach access with its world-famous shelling beaches is a mere 71 yards away. The Chez Shells location allows you to see more stars than you could ever dream of. 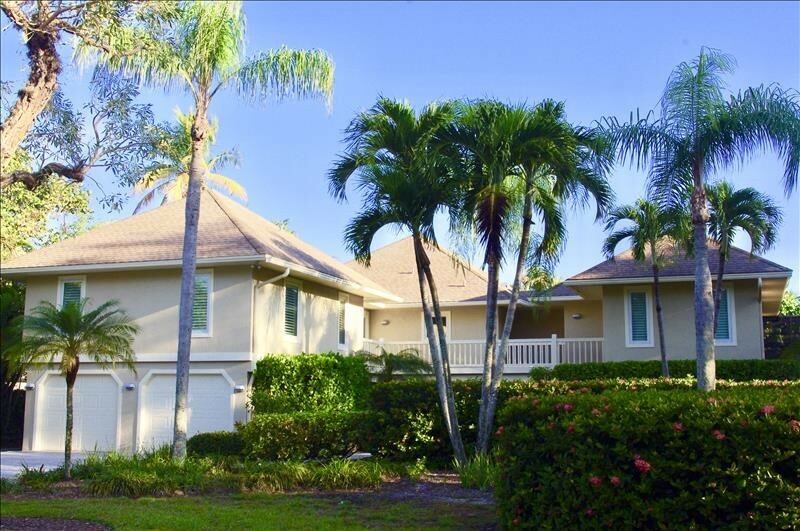 It feels private, but not isolated, and this home is minutes away from all the shopping and dining that Sanibel and Captiva has to offer. 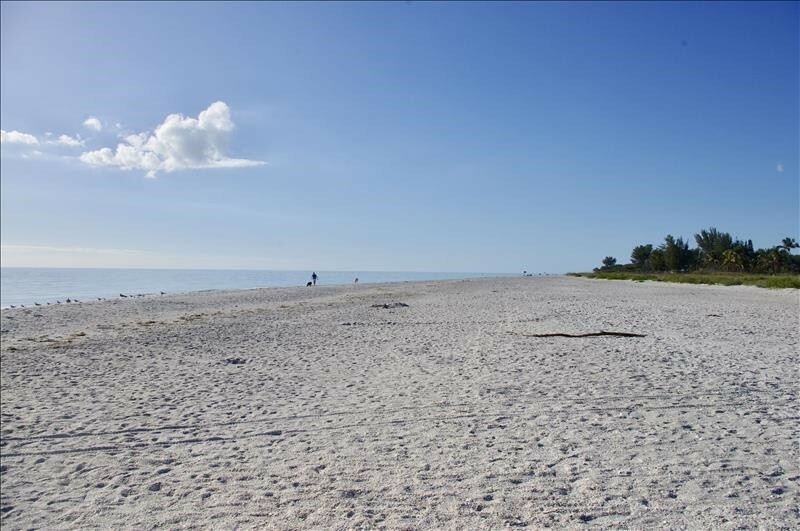 The world-famous Gulf of Mexico shelling beaches are a short 71-yard walk from the house. 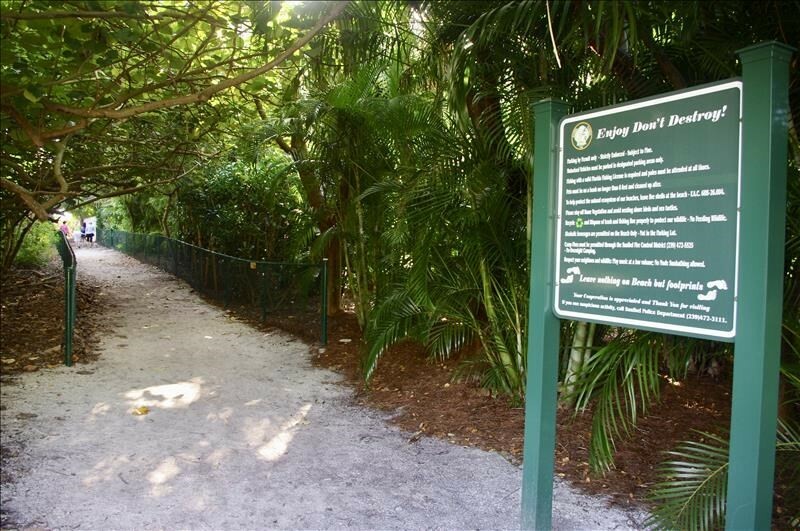 Enjoy strolling down the lush, tropical foliage-lined path that opens up to reveal expansive panoramic views of Sanibel's famous sugar sand beaches. 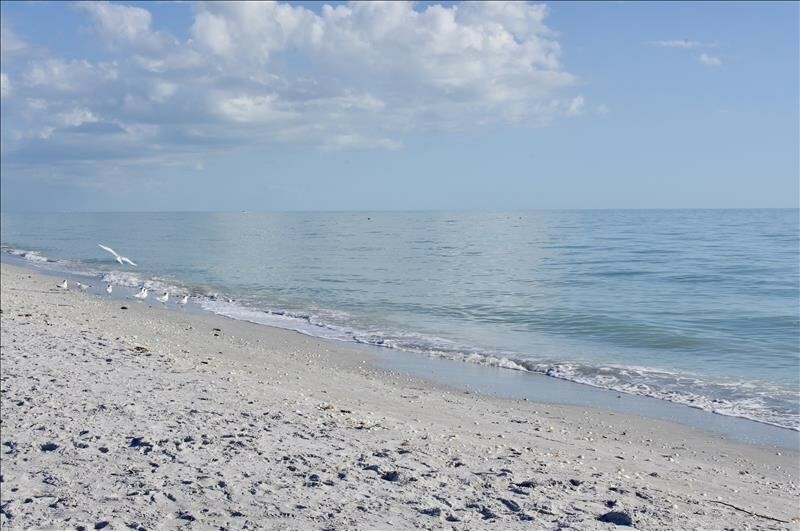 Beach towels and beach chairs are provided, so you can while away the days on the beach and comb for seashells, bird watch, fish for your dinner or watch the dolphins cruise by every sunrise or sunset. Any time of day, the beaches are breathtaking. Featuring 3 bedrooms, 3 baths, Chez Shells offers an outstanding variety of amenities and appointments. With an outdoor heated pool, two car garage, elevator, beautiful hand-scraped Hickory hardwood floors, a fireplace, video doorbell greeting system, whole house backup generator and so very much more, Chez Shells is waiting to be your home away from home for a month or longer. The great room is the heart of the house, and it features vaulted ceilings that showcase the stone fireplace, furnishings and beautiful artwork. Florida is famous for its sunshine, and there is no shortage of fantastic natural light throughout the great room at Chez Shells. With its coastal, elegant decor, the living room seats 7 comfortably. Whimsical pillows and accessories by acclaimed designer Dana Gibson accent the comfy sofa and overstuffed club chairs, creating a relaxed, lighthearted aesthetic. You can easily entertain family and friends, settle in for brunch or with cocktails, a good book, or enjoy a movie or your favorite show on the flat panel tv. There is also a game table that is perfect for playing a friendly game of chess or cards. On cooler days, open the sliding glass doors and let the fresh Sanibel air in. Enjoy outside dining on the outdoor deck overlooking the screened, heated pool, or take an afternoon siesta on the teak chaise lounges. In the evening, enjoy the warmth of the fireplace without all of the work! A quick click of the remote control and its various pre-programmed settings will create a cozy, homey atmosphere within minutes. The light and bright fully-equipped kitchen features quartz countertops, custom cabinetry with roll out drawers containing china, glass and silverware galore, stainless steel KitchenAid appliances (including double ovens) as well as a gas cooktop with a downdraft ventilation system. The oversized island makes meal prep a breeze, and three Seraphina Chippendale barstools provide additional seating for extra guests. You can enjoy a more formal meal in the dining area, which is adjacent to the kitchen and seats 6 comfortably. In addition, sliding doors open up to the outdoor deck that overlooks the pool. The living room, dining room and master bedroom have access to an outdoor deck that overlooks the swimming pool. Relax on the chaise lounges, or enjoy a meal at the outdoor dining table that overlooks the heated pool, or do some gentle yoga and listen to the sounds of the birds around the property. The master bedroom has its own private wing on the east side of the house. Beautiful linens and Dana Gibson pillows adorn the king sized bed, while curtains and Plantation shutters allow just the right amount of light to stream in. 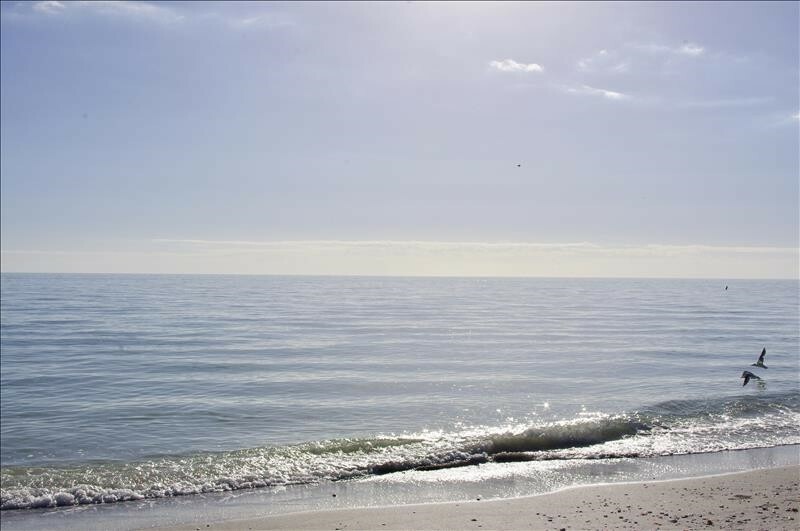 Turn on the flat panel tv to check the weather report so you can take advantage of the best shelling and fishing tides, too. 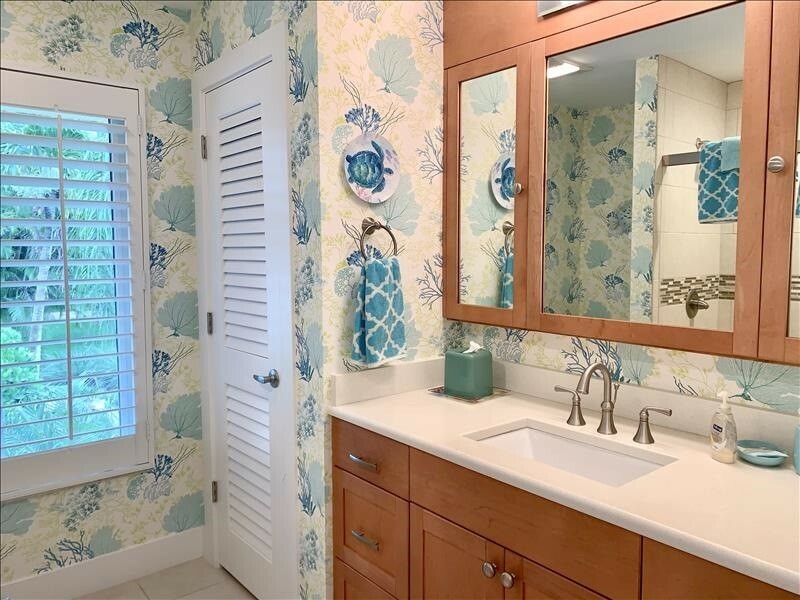 The spacious master bath features dual vanities with a quartz counterop, ample drawer space, a walk-in shower featuring inlaid glass listello tilework, dual showerheads (hand held and fixed), and a separate water closet. If your clothes and accessories are works of art to you, it’s time to display them properly in the functional and stylish walk-in closet. Your favorite island ensembles are organized and easy to find here. Plans while on vacation can change very quickly and being able to work remotely is entirely possible at Chez Shells. The private home office/den has a gorgeous built-in work space with high speed wireless internet, a twin sleeper sofa, and access to a deck overlooking the front garden. It is separate from the rest of the house, and affords privacy and quiet for those days that a conference call is a must. The west wing of Chez Shells is around the corner from the great room, just beyond the elevator and main staircase; and, it is where the guest bedrooms are located. Guests will enjoy the calm blue and green hues in the Queen bedroom, with its sea urchin lamps, sealife accessories and Pine Cone Hill linens. It features a walk-in closet and a private Juliet balcony with seating for 2 that is a perfect spot for morning meditation, reading or yoga. 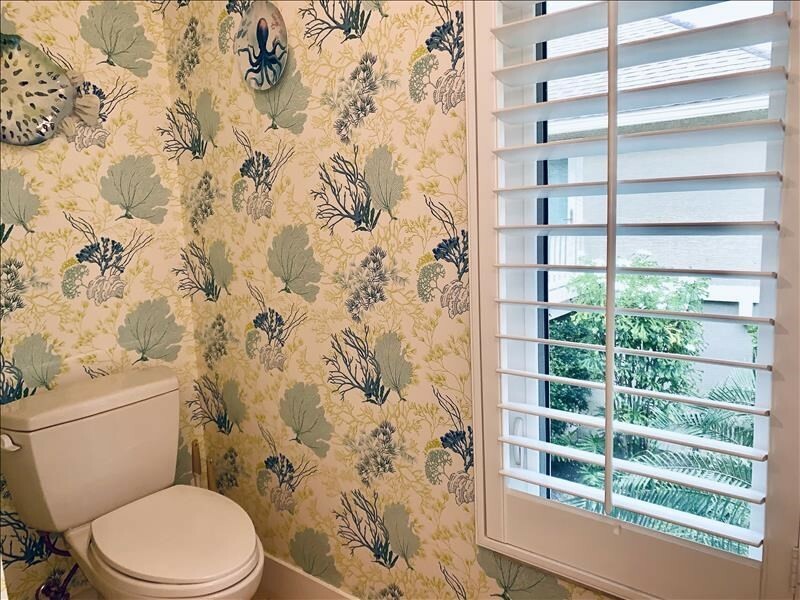 Custom Plantation shutters adorn the windows. The cheery twin guest bedroom is spacious and filled with natural light. The adjustable bedside lamps allow for night time reading under the comfort of the luxurious duvets. It also has a walk-in closet and Plantation shutters. The guest bedrooms share a 3-piece bath featuring a walk-in shower with inlaid glass listello tile and seamless shower doors, a single vanity with a quartz countertop and linen closet. The ground level entry has a glass-door elevator, which is perfect for transporting luggage and groceries to and fro during your stay. In addition, if you're keeping fit and counting your steps, there is a staircase that leads to the main living level of the house. Just around the corner from the kitchen is a lovely 2-piece bath and laundry room with a high efficiency front load washer dryer, as well as central vacuum and other housekeeping items and items and aids. A quick trip downstairs leads you to the screened outdoor heated pool and downstairs seating area that is surrounded by lush Areca palms. Swim laps in the pool or prepare your catch of the day on the gas barbecue grill. 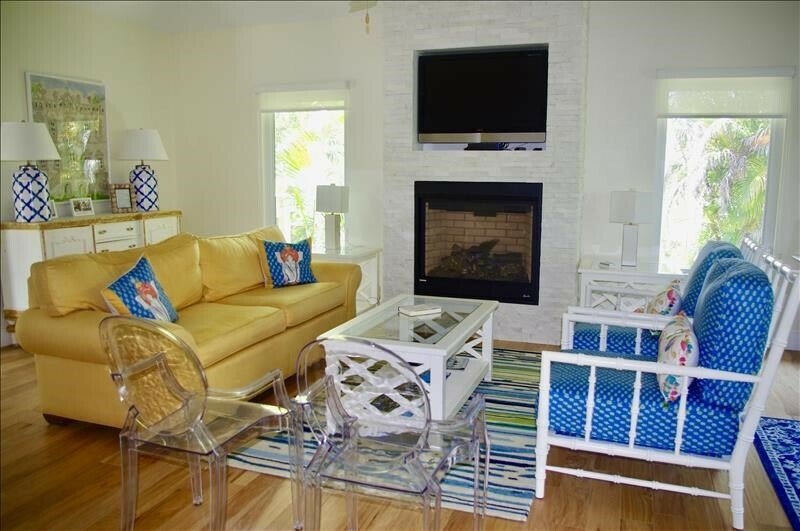 Reserve Chez Shells for your family getaway and enjoy one of Sanibel’s finest homes - we'll assist you with every aspect of your vacation planning. 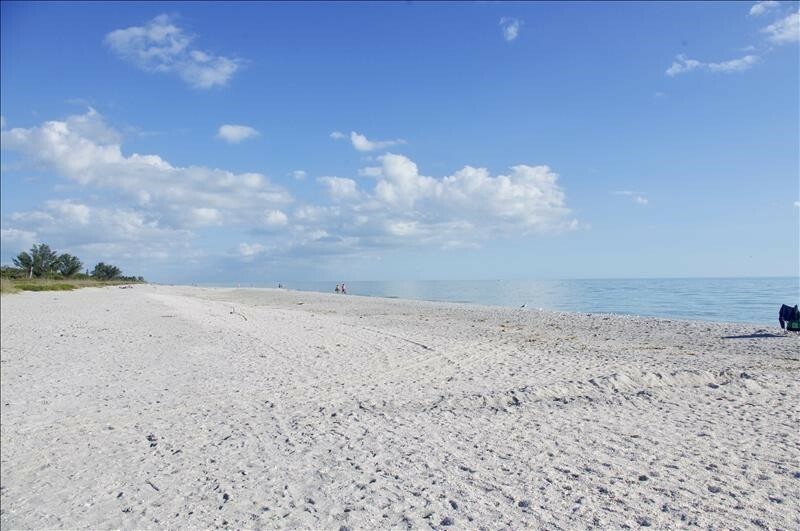 Chez Shells is professionally managed by Cottages to Castles of Sanibel & Captiva. Since 1997, they've been making sure that each stay is a memorable one. Per city zoning regulations, Chez Shells requires a minimum 28 night stay, no exceptions. Please contact me with information regarding Chez Shells. We enjoyed staying in your lovely beach home! The proximity to the beach access is great. 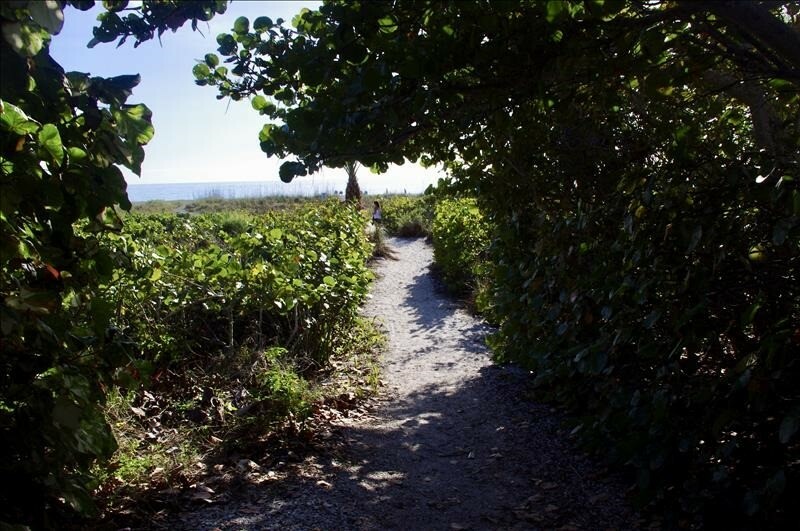 We love Sanibel and Thank You for sharing your house with us.